Mary Ellen Mabe is the featured artist during the month of August at The Artists’ Gallery. On First Friday, August 3, there will be a reception from 5 to 8 p.m. at the gallery, located at 239 High Street in Chestertown. 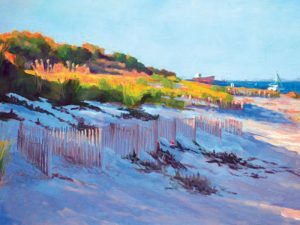 Mary Ellen is a member of the St. Michaels Art League, Working Artist Forum, based out of Easton, and the Academy Arts Museum in Easton. She has been selected seven times for Local Color, a show featuring Delmarva artists as part of The Avalon Foundation’s Plein Air Festival in Easton. Mary Ellen is also a six-year participant in “The Arts in Easton” banner program. She was a juried artist three times in the Fine Arts @ Oxford Show. Currently, Mary Ellen is represented by The Artists’ Gallery. Mary Ellen recently exhibited at the A.M. Gravely Gallery in St. Michaels as part of the Working Artists Forum summer show. She is participating in the St. Michaels Art League show “Reflections: Natural and Imagined” at the Academy Art Museum through August 19. For more information, call The Artists’ Gallery at 410-778-2425.